You know what it feels like when you reach a certain age. Your 20s are a distant memory, those halcyon days when a night out meant drinking, dancing and an unquenchable reserve of energy. Recovery took a matter of hours and a hangover could be cured with a bacon butty and a brew. Now the thought of slepping into town on a Saturday night fills you with horror. The prospect of a sweat-filled nightclub is an anathema, pints costing more than four quid unthinkable and the idea of a long bus ride home distinctly unappealing. But here’s the rub: you still want to go out, you still want to put your glad rags on and you still want to have a boogie. And now you can. Bop Local is the brainchild of DJ Phil Beckett and promoter Tom O’Toole. 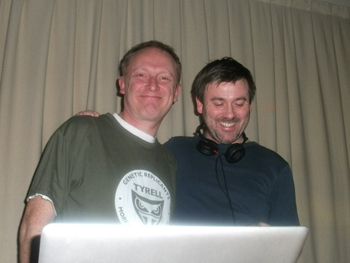 Between them they have a wealth of experience on the Manchester music scene, including Phil’s residencies at South, the Hacienda and Paradise Factory, to name just a few iconic Manchester venues. Add into the mix their coterie of music legend guest DJs, a top-of-the-range sound system and a professional light show and you have all the ingredients for a proper good night out without any of the hassle. The ethos behind Bop Local can be explained by its slogan: “Keeping babysitters happy since 2010”. 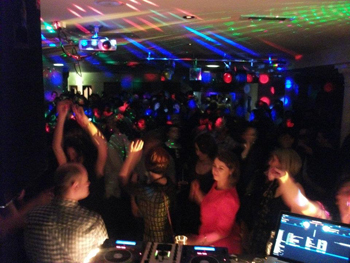 Their club nights start early (8.30pm) allowing parents to let their hair down and still get home at a decent hour. For the more adventurous, dancing continues until 1am, all the while accompanied by a modestly-priced bar and a DJ set that won’t have 40-somethings running for the hills. Venues are strictly suburban, from Bop Local’s spiritual home at the Chorlton Irish Club to events in Heaton Moor and West Didsbury. This weekend it was the turn of Ramsbottom, a semi-rural former market town north of Bury that prides itself on breaking new cultural ground. At first, the evening had echoes of the school disco or family wedding reception. This reviewer half-expected to see awkward teenagers snogging in corners or small boys skidding across the dancefloor on their knees. Ramsbottom Civic Hall, newly-refurbished, is what it is: spacious but mostly lacking in charm. However, the place soon filled up and it wasn’t long before an eclectic mix of locals were strutting their stuff to northern soul classics and old favourites. Although Ramsbottom is home to just 14,000 people, it is not without celebrities. One of these, Coronation Street murderer John Stape played by actor Graeme Hawley, was spinning the discs on Saturday night. His presence injected an element of frisson into the evening and reminded this reviewer of the greatest local newspaper headline of all time: “Corrie Killer Loves Rammie”. Although Bop Local is clearly aimed at people of a certain age, Ramsbottom proved that it can cater for all; a genial and sensibly-priced evening with no need to shell out £50 for a taxi home has wide appeal. So if you are offered the opportunity to bop in your local area, take it. But have the bacon butties at the ready.